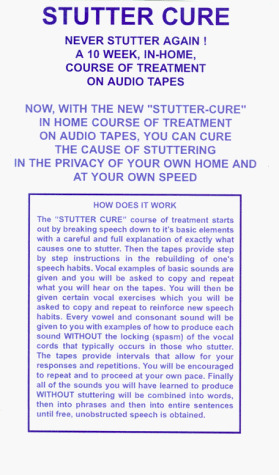 The "STUTTER CURE" program breaks speech down to it's basic elements with a careful and full explanation of exactly what causes one to stutter. Then the tapes provide step by step instructions in the rebuilding of one's speech habits. Vocal examples of basic sounds are given and you will be asked to copy and repeat what you will hear on the tapes. You will then be given certain vocal exercises which you will be asked to copy and repeat to reinforce new speech habits. Every vowel and consonant sound will be given to you with examples of how to produce each sound WITHOUT the locking (spasm) of the vocal cords that typically occurs in those who stutter. The tapes provide intervals that allow for your responses and repetitions. You will be encouraged to repeat and to proceed at your own pace. Finally, all of the sounds you will have learned to produce WITHOUT stuttering will be combined into words, then into phrases and then into entire sentences until free, unobstructed speech is obtained.